As marketers follow the consumers and as more media budgets move digital, the industry has struggled with fundamental transparency issues – supply chain transparency, brand safety, media tracking and measurement, and the advertiser-agency relationship. Awareness for these topics seems to be at an all-time high, yet we're constantly being reminded that the industry hasn't solved them yet. Whether you think of transparency issues as new challenges or just an unavoidable part of engaging consumers in the modern world, below are a few of the current issues and some best practices for solving them. ANA reported on a study that found most advertisers spend 48 cents of every dollar to cover digital supply chain data and fees for programmatic transactions. When demand and supply-side fees and agency trading desks are added, the cost goes up to 54-62 cents of every dollar. 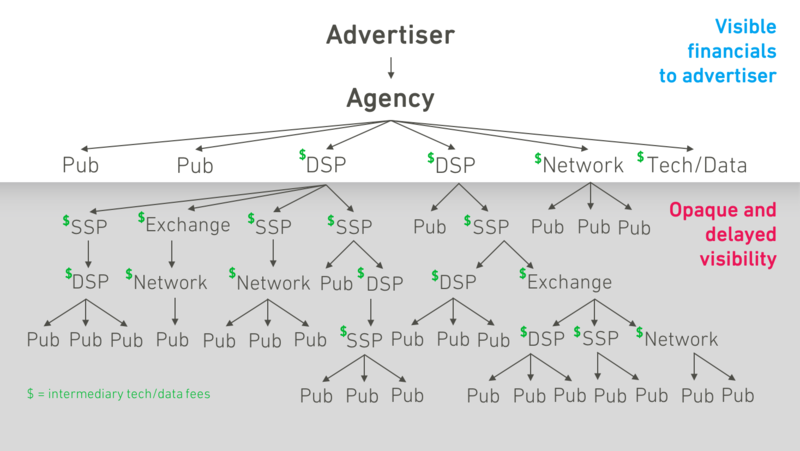 Not only does this leave publishers with only 38-46 cents of every dollar, but it means advertisers are paying relatively high operating margins compared to traditional advertising. Thorough media auditing is a partial solution, however auditing is expensive, time-consuming, manual, and doesn’t entirely reveal financials across the supply-chain. Additionally, brands may find that they’re paying hefty fees only to end up on undesirable, and sometimes even blacklisted, sites. Last year NYT interviewed brands who had black-listed Breitbart news only to still end up running on the site, thanks to complicated and often untraceable ad network buys. As the 2017 YouTube incident reminded us, buying and selling on audience targeting alone isn’t good enough when that comes with the risk of your ads running next to controversial, extremist, and sometimes violent, content. And even though those “misplaced” ads were minimal, the public backlash, fueled by social media, had an outsized effect on brand reputation. To improve transparency, marketers need to create or expand their data and supply chain strategies. A good place to start is enforcing standards across vendors, setting up operational leaders, and getting agreement on tangible milestones for the whole industry to meet. This requires the collaboration of multiple constituent organizations with an equal level of urgency. Additionally, there are a number of supply-chain insight solutions that already exist and new solutions coming into market, specifically integrating planning and buying workflow to gain quicker and more insights into planned versus actual spending, as well as early applications of blockchain technology, where Mediaocean has a strong head start. Test or look into some of these solutions, as you will have an opportunity to drive the industry forward in an emerging and very promising technology area. Luckily, we’re seeing some early, promising signs. A survey performed by World Federation of Advertisers found that of 35 brands, 54% had begun working with third parties to monitor ad placement and 37% had stopped advertising on platforms that lacked third-party verification. But be careful what you wish for. As Belinda J. Smith, global director of media activation at Electronic Arts argues, once we clean up our supply chain, costs may go up. This higher price may just be the cost of a precisely-targeted audience with less waste, and the industry should adjust their expectations. We also see media sellers reducing lower value inventory such as banners where fraud is more prevalent and focusing instead on higher value video inventory. These modern advertising challenges aren’t limited to digital only. Marketers struggle to piece together audiences and accurately measure campaign success, an especially difficult task for cross-channel campaigns that have a variety of KPIs. This challenge is amplified by not having adequate ways to track planned vs. actuals spend across regions, channels, and agencies in the first place. So much of this is currently tracked in Excel sheets or systems that are completely disconnected from the rest of their toolset. If basic media spend can’t be reliably tracked, then how is a marketer to layer analytics and measurement tools? Without measuring both spend and efficacy, the task of proving advertising ROI, getting future budgets approved, or fundamentally proving marketing department impact, becomes vastly more difficult. In the current economy, where brands have several products, track various KPIs, partner with multiple agencies, and operate around the globe, they need their data in a central place in order to analyze and measure it, and improve campaigns. Brands themselves should control both transaction and user level data that they have access to, and also contract partners to adhere to your data policies. Facebook’s recent issues with Cambridge Analytica highlight how critical it is to have a firm grasp of the data you have, and to set explicit rules about how that data is used. Those global brands who don’t do this increase their regulatory risk because of stricter policies such as GDPR. Besides simply collecting and storing data, there are media management tools that can even help manage a brand’s relationship with their agencies by controlling which data each partner has access to, monitoring planned vs. spent, and providing insights that guide strategy. These tools should also have open API architecture, so you can seamlessly integrate CRM, analytics, optimization, or any other necessary tools. The third piece to this puzzle is the agencies themselves and their contractual obligation to their clients. An industry-shifting 2016 study conducted on ANA’s behalf sites evidence of non-transparent business practices between media agencies and their clients. The causes were predominately attributed to conflicts of interest with an agency’s holding company, unclear contract terms, a need to increase profit margins, or advertisers who weren’t as knowledgeable or organized as they should be. When neither party assumes authority for mastering the changing media landscape, it becomes easy to exploit its weaknesses for greater profit. ANA recommends appointing an executive to oversee all processes relating to media; an individual to be accountable for all of a brand’s media spend, performance benchmarks, scaling best practices, and advocating for the best partners and tools that can help achieve these goals. This role should be the brand’s internal subject matter expert on all current media issues and trends. But with a remit so broad, brands are certainly not looking to eliminate agencies. Though, as traditional agencies evolve and take on a more consultative function, brands will need to decide which stages in the cross-media planning, buying, and measurement process they wish to own and which they will rely on their agency to manage. Clearly defined roles will allow brands to begin controlling the transparency of their media supply-chain and ideally encourage their agencies to support a more transparent workflow for planning and executing cross-media campaigns. It is a two-way street however. Agencies’ slimming profit margins are making it more challenging to invest in their people and innovation for clients. If brands want the best technology and full transparency, they must be prepared to pay their agencies accordingly or be prepared to take on more responsibility for their media supply chain. Many brands are already implementing these principles and practices with success. But as the digital landscape evolves, so will the solutions for ensuring transparency, and only the most educated and vigilant marketers will continue to win.